Originally "Dutch Guiana" consisted of four colonies (from west to east): Essequibo, Demerara, Berbice, and Suriname. The three first became British in 1814 and some years later they were united into one colony: British Guiana. They were occupied already earlier by the British (to keep it from the French, approved by the Prince of Orange in exile), like the Suriname, the Antilles and East Indies, who became Dutch again, and Ceylon and the Cape, who remained British. A coastal scene with one or more ships was often part of the seal of a British colony in the latter part of the 19th century, and this was used as the badge of the colony if there was no obvious local emblem. Although the British Guiana badge is unique in having just one ship and no coastline, it is unlikely that the drawing was meant to represent any particular ship. The ship in the original circular badge of 1875 is different from the ship in the oval badge enclosed in a yellow garter of 1906, which is different again from the badge that was taken from the arms granted in 1954. The 1906 badge had been criticised for having a number of nautical anomalies, and in 1953 the Colonial Office asked the Admiralty for help in ensuring that the arms were correct from a seaman's point of view. If the badge had been meant to represent a particular ship I'm sure it would have been mentioned at that time. British Guiana used a circular seal in 1875 flag. It was changed to circular seal in oval garter in 1906. It was changed to the arms in 1954. The red ensign was unofficial. 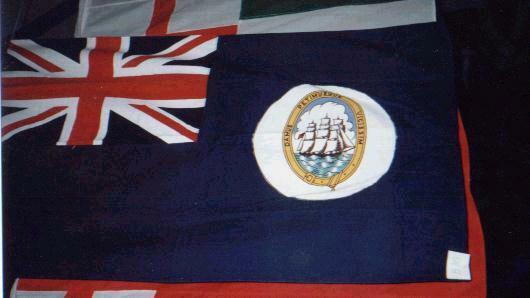 Old designs (before 1919) showed white disk in the blue and red ensign . 1875-1906. Circular badge having a starboard bow view of three-masted square-rigged sailing ship filling the whole of a standard 4/9th circular badge. On UJ and Blue Ensign. Presumably derived from local scene panel of the seal of the colony. Not very distinctive of the locality, but one of the better circular badges. It has been noted that there was no official defaced red Ensign, and that seems to bear up with some literature here on my bookshelf. "Commercial vessels flew the British merchant flag, i.e. the Red Ensign without any badge"
1. A Blue Ensign: for armed and unarmed government vessels. 2. A Governor's flag: badge enclosed in garland on Union flag. David Prothero supplied me with a scan of the "official" badge of the British Colony which defaced the British Blue Ensign between the years 1875-1906. In this badge there is no ensign at the stern, but rather just a masthead pennant in British Navy red flying from the main mast. Unless there is convincing proof that there was such an unofficial ensign I think it should be consudered very dubious. In my humble oppinion, it had never existed. I have to support David on this one. Even an 'unofficial' defaced Red Ensign does seem extremely unlikely for late-19th Century British Guiana. Between 1905-1919 was the same . Here is a photo of a badge on white disc taken by me at a flag display in ICV 19 (York, July 2001). The origilal flag is from Clay Moss collection. According to the display catalouge: "The motto translates as: "We give and seek in return." Illustrations are based on the badge defacement illustrated in "Das Grosse Flaggenbuch 1992", which in turn copied the "Admiralty book of flags 1907". The basic difference in the drawing is the sea. Admiralty book of flags shows a choppier greener sea, whilst Flaggenbuch displays a smoother blue version. From "The Flag Bulletin XXI:4/95"(July-August 1982), Father David Drake-Brockman wrote: "From about 1900 till the end of 1954 a slightly different version of this badge [He was reffering to the first badge of the Colony,MG] was in use. The ship, flying the Red Ensign, sails within an oval garter-like yellow scroll around the top part of which is written the motto also found in the seal". British Guiana adopted new Arms in 1954 and this was provoked by requests received by the British Guiana Government three years previously. Upon investigation it was determined that the seal and flag badge long in use had no official standing in armorial form. When the request was sent through to the Secretary of State for the Colonies to the College of Arms, it was pointed out that some criticism of the old design had been made because the wind seemed to be blowing the sails and the flags of the ship in opposite directions.